what kinda of plate did you use for this? just a regular oven plate or there's a special kinda plate? thankss you're blog is very helpfullllllllll! 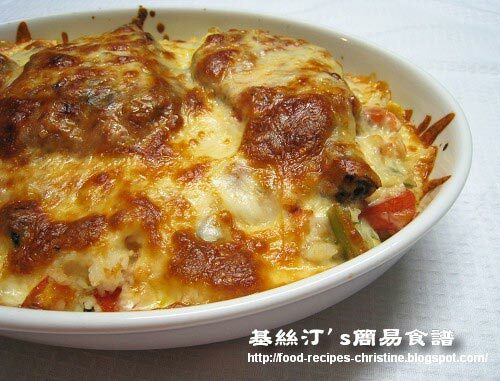 I used ceramic baking tray for cooking this dish, that conducts the heat better. I live in HK and my kitchen is very small, i only get a microwave oven but i like to cook meals myself. Would you be kind enough to introduce some microwave recipes and they do not need to fry any stuff as i do not get 抽油煙機 to exhaust oil and smoke. Thank you very much! So sorry that I don't use microwave oven to cook actually, just for reheating. I understand your needs and situation, it might be a good idea to get a cookbook specialized in microwave oven cooking. What do you think? Why not? 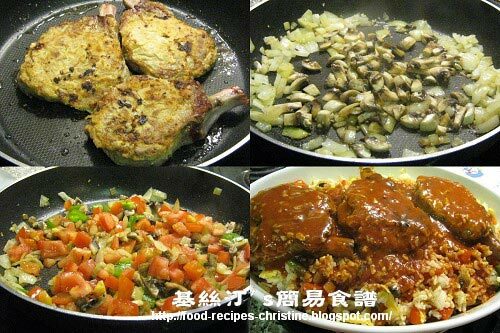 It's a good idea of using fried rice with pork chops in tomato sauce. It should be very delicious too. I'm your big fans :) May I know how many cheese that you'd put in and the portion for this recipes is for how many people? You can sprinkle as many cheese as you like. No exact amount required. we love u. You are so great and generous to share your recipe. My husband and I are hunger for HK taste as the only good taste HK restaurant is quite far. I have tried the 'so good' recipe but we don't like it. I follow yours once, BING! Got it! Keep it up! We love you. My husband and I miss the HK taste so much and the only local good HK cafe is quite far. I have tried the 'so good' recipe but it is too juicy. Then I see yours. Bing! Got it! Thank you for your generosity to share the recipe. Keep it up! Aw, it's so nice to read your message. Very encouraging. Yeah, we both miss the real, authentic Hong Kong foods. This baked pork chop rice is a must to keep eating. Now, everything is ready and handy to gather, we can whip it up whenever we crave for. Happy cooking to you, Margaret! Wow! Lots of good and easy recipes for us housewifes in Canada too! This is my first time to view your website. I live in Sydney and always want to cook Baked Pork Chops with Fried Rice at home. I'll follow this recipe next week. However, what kind of rice we should use? Leftover rice or fresh cooked rice? Leftover rice is better because the rice won't get soggy after frying and topped with sauce. But sometimes I used freshly cooked rice. Just add less water to cook the rice. It works for me too. God truly gave you a cooking talent. I tried your lamb shank and pork chops on rice. They are wonderful even my Caucasian husband likes the Hong Kong Style baked pork chops on rice. As to the Japanese Cheese Cake, I failed the first time. No matter how long I cooked (over 2 hours), it's still soggy inside like an egg tart filling. Then, I used the recipe from food.com, which is very similar to yours but with much less milk (3 oz.). I succeeded. I wonder whether you have a typo mistake in your recipe. Did you use 1 cup (250 ml) milk to make your Japanese Cheese Cake? Thank you for sharing your recipes and tips. Thanks for your nice words. I have double checked the recipe. It's all right. Many of my fans baked their cheesecakes with success as well. Yes, there are many variations of Japanese cheesecakes. Those with less milk will produce more cake-like texture. And this one here is tremendously creamy and smooth, needs more baking time. I tried this recipe this past weekend, and it was good. Somehow the sauce color is not as dark as yours. Why is it? Could it be the colour of tomato paste or soy sauce? Can I use the Cream Cheese as one of the ingredient in this receipt? It's better to use stretchy cheese, like cheddar, or Mozzarella. Thank you for this wonderful recipe of yours. It turned out truly delicious and way better than what i had in any other HongKong cafe. And i cant even find a HK cafe in Christchurch! Forgot to buy the tomato paste, so i used the tomato pasta sauce, and it still taste wonderful! Do share with us more HongKong cuisine! Wow, your comment really made my day. Thanks for letting me know how you like my recipe. Sure, I'll post more once I've done any. I miss my hometown foods too. Yeah, this dish can be twisted in many versions. Glad that you loved my recipe.